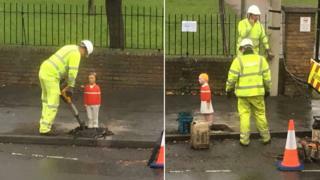 Image caption Buckinghamshire County Council said the bollards were rotated "at the request of a resident"
Child-shaped bollards which were branded "creepy" by residents have been repositioned by a local council. Earlier this year, Buckinghamshire county council installed the bollards in Iver in a bid to deter people from speeding outside schools. Recently two of the bollards were dug up and repositioned by the council. A spokesperson for the council said: "At the request of a local resident we have recently rotated the bollards so they are facing into traffic." There are eight of the child-shaped bollards outside four primary schools in Iver and Iver Heath. Iver Parish Council said the bollards cost £5,395, excluding installation. In September, local resident Jonny Baker said the bollards were "creepy and hideous". "I look out of my window every morning and these are what I see. They're absolutely terrifying," he said. Buckinghamshire county council said the bollards were installed at the request of the parish council to warn drivers they are approaching crossings used by school children.